It is Thursday March11th 2010 and I am back in class teaching at MCTI. A great class this time with lots of talent and lots of questions. The client kind of washed out so I think I am going to put them to work designing the next A Second Byte Computers site. That should be fun at any rate. So I guess the slacker is back. I have not posted since my last class back in December I will try to keep up. It Friday March 19th and I want you all to meet Lou. Lou is Traci's cat who moved in with my Son's girlfriend, Traci. 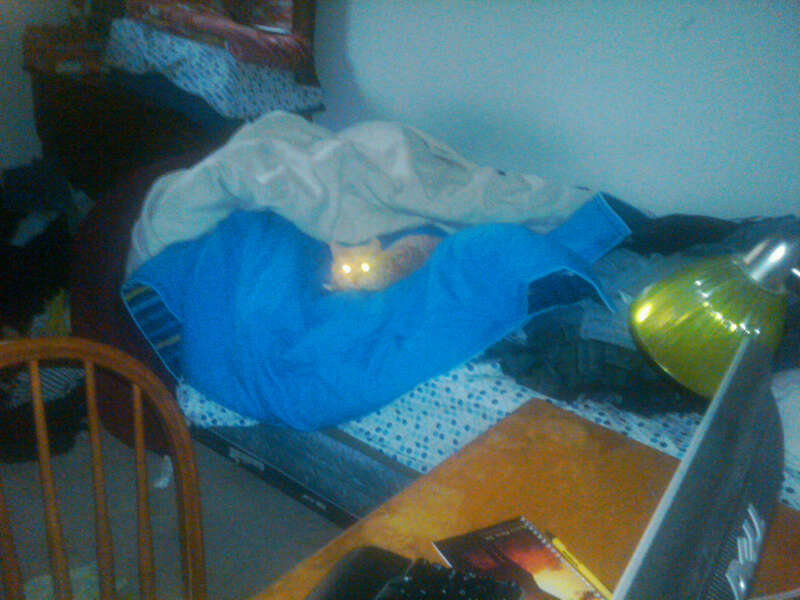 You have read about Traci before so I want you you meet Lou who has super powers as you can see. He has meat vision! Ok, I am sure you all want to know why meat vision? I got that from the Fairly Odd Parents, when Timmy's dad develops super powers. He got Meat vision out of the deal, and his eyes kind of looked like Lou's here. 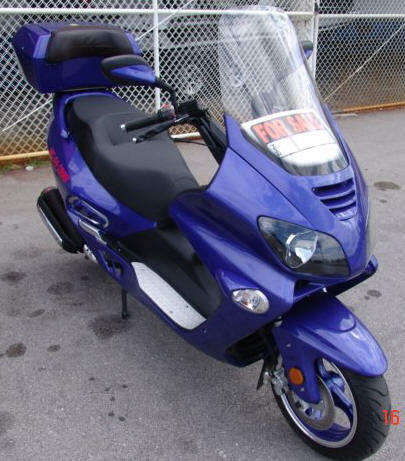 So, I found my scooter! It is Sunday March 21st and I have yet another new toy. 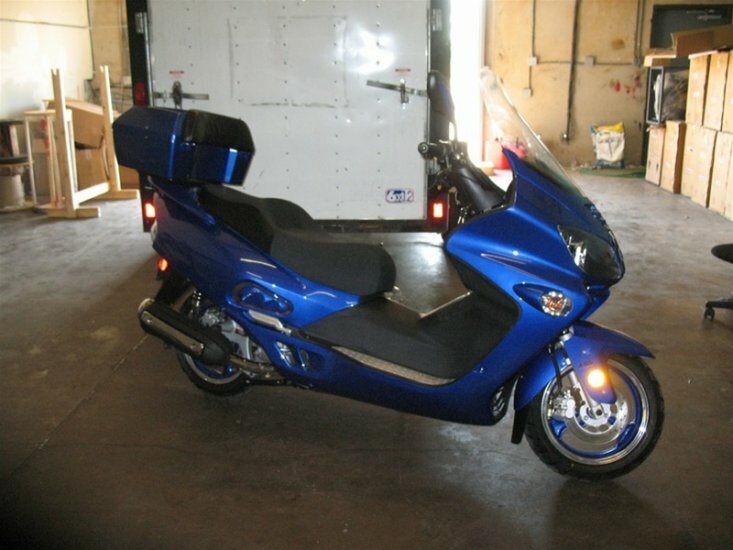 It is a 2008 Apollo Chinese scooter. Here is how this scooter thing works. The Honda corporation puts out a nice scooter. Honda is a Japanese product. 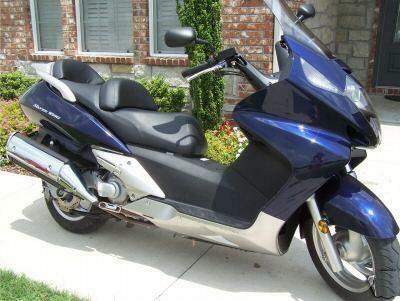 The Chinese are a very smart people and copy the Honda design and put out a knockoff. It is called a Roketa. The Apollo is a knockoff of a knockoff. Let me show you the three pictures, They are pretty close. and you can see where the copies were made It is neat looking, and everyone is telling me not to have faith in a china product, but I am willing to give it a whirl. I needed this to learn on. The Honda I have trouble with the foot pegs (Reaching them) so I wanted something smaller to cut my teeth on. This little bugger is a snotty little thing. The 250 CCs really kick. I am having a good time learning to take care of it. 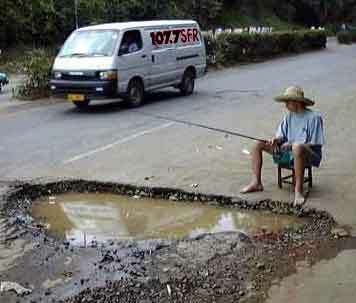 Pothole... Fill it fill it now! 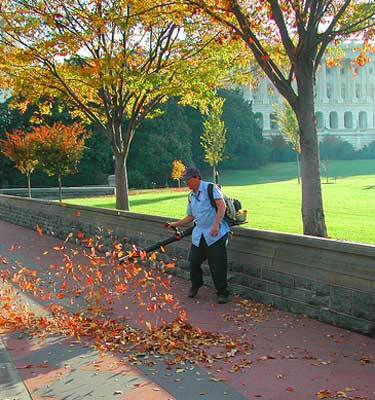 Get rid of the debris you can slide out on. Ever wonder what happens when a scooter meets a mailbox? This is pretty much the result. It is Wednesday March 24 and I just got done putting the scooter away at 6:00 pm and I want to tell you a few things concerning trust. Motorcycles are vehicles based on physics. I get that. I know how gyroscopes work. I also know how the theory of motorcycle leaning works to go around corners. What I really need to learn is to trust my path, both really and figuratively. 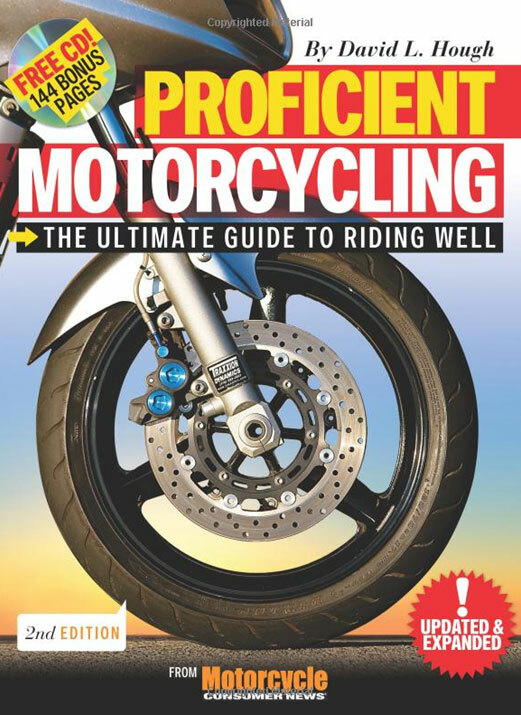 I have been reading the series from David Hough called Proficient Motorcycling. (Seriously though, after you get your permit, I feel it is a necessary read.) This book can scare the crap out of you! I am pretty sure from reading this book that for every 5 people who ride motorcycles, 7 of them die! 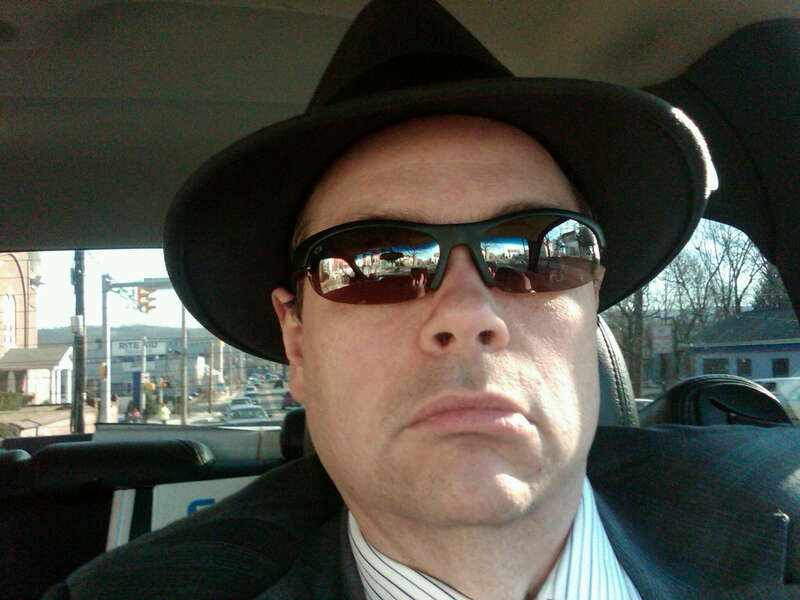 I am concerned about surviving this new endeavor, but I am facing my fears and trying to minimize risks. Risk 1. Gravel on the road causes Slide outs. Neighbor: Sir, SIR What are you doing? Me: Oh Hello. I am blowing the rocks off of the road. Me: Well, I just got my permit to ride a motorcycle and I am afraid of sliding on the loose gravel and I want to remove the risk of crashing. Neighbor: Do you work for the Town? Neighbor: Well, I have this pothole in the end of my driveway, and I would like you to fill it. Me: I really do not work for the town. You might want to call them. Neighbor: It will not take you long, just go get one of those big yellow trucks you guys have and some of those black sticky stones and fill in my pothole. Me: I really don't work for the town, and I think they would be mad if I took one of their trucks. Neighbor: I pay my taxes, and I want my pothole fixed. Me: Yes M'am, I'll get right on it. Neighbor: Don't forget the truck! Risk 2. The Right Gear. A certain percentage of the riders who get hurt get that way from not wearing a helmet, or leather jacket, or boots. so here I am on my scooter, full helmet, boots, and leather jacket, looking like a hell's angel, on my scooter. Well, at least I am safer. Had I just trusted the engineering or design and had faith, I would have been fine but no, I had to stick my big fat foot out there. Not that I am discounting fear. Fear is a good thing, it tends to keep us from doing stupid things that can get us hurt. But fear needs to be tempered with faith, skill builds with time, and both me and the scoter have a few scratches we did not have before, but I will heal and the scooter might get a paint job, but more likely it will wear the scar like a badge of honor, where it taught me to have faith, trust the engineering, and build skills for the future. 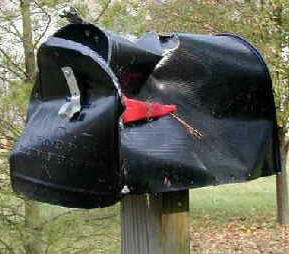 The mail box however got the worst of it. Frankly I am sure that is an occupational hazard. It could have chosen to be an email box, Email boxes almost never get run over by motorcycles.